Paving stones are beautiful, durable and, when properly installed, they add value to your home. Paving stones are often called interlocking brick and they are used to build patios, paths, and are often used for borders between grass and gardens to aid in lawn mowing. Paving stones have been around for thousands of years and you can see them in many older cities throughout the world. From Greece to Mexico, England to Quebec, paving stones have been the long lasting classic choice of builders throughout the ages. Why are paving stones still popular today? The simple answer is that nothing has come close to offering the beauty of paving stones and nothing can outlast them. There are endless styles and colours of paving stones for you to choose from. We can help you decide on the right paving stone design, style and colour to suite your yard. 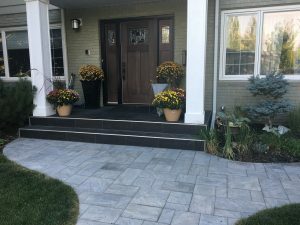 We cannot stress enough how important it is for you to choose a Calgary paving stone company who has demonstrated they know how to properly install paving stones. We have spent a lot of our time repairing other landscapers work and most of it involves improperly built patios and walkways. One of the most important aspects of paving stone installation is excavation. The soil needs to be removed until clay is reached. This can often mean you need to dig out a foot or more of soil which for an average size patio or walkway can translate to a dump truck full of soil to haul away. If you do not dig down to the clay level chances are your paving stones will end up a sunken mess in very short while. The reason for the sinking and shifting is primarily due to frost heaves, the freezing and thawing of the crushed gravel below the paving stones. We build our paving stone patios and walkways right! Chinook landscaping and design inc. takes the time to properly install your paving stone patio or walkway. We do not cut corners and we absolutely refuse to do anything but build your landscape professionally from start to finish. Our employees are some of the highest paid in the landscaping industry and they are all professionally trained and have a thorough understanding of how to install each landscaping component.